7v7 is one of the fastest growing sports in Canada and is becoming one of the main platforms for players to compete against some of the more talented players in the area while limiting the risk of injury. This is an 8 game season that starts in mid February for ages (14-19) and is designed to supplement and bridge the gap between high school and summer football. The IDFFL 7v7 league is the best way for skill position players to improve their football skills, enjoy staying fit and have fun playing in a highly competitive and safe environment. Don't miss your chance to join the fastest growing football development program in North America!! League All-stars will be selected to participate on the Team Canada “ELITE” 7v7 All-Star Travel Team. 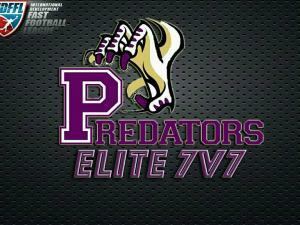 If you're interested in joining our Elite 7v7 team and are aged 14-19 please register to try out. Our roster will be 24 players MAX. League Early Bird Registration is Open Until Dec 15.